I’m a slacker. I don’t always eat breakfast. It’s not like I don’t try. Every night I go to bed thinking I’ll wake up in the morning and make myself french toast, or pancakes, or an omelet. Of course, the morning never works out that way. 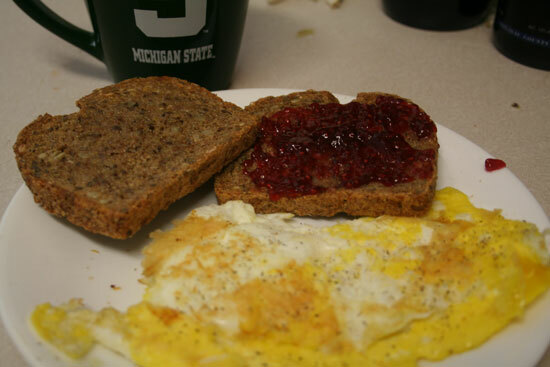 There is a quick alternative, though: Eggs and toast. Not only was it simple, but it’s real, local food. Bread: Farmer’s Whole Wheat from Breadsmith. Eggs: Vegetarian-fed, cage-free brown local eggs. Coffee cream: Half & half from Calder’s Dairy. And it got me thinking about what this meal would have looked like 2 years ago (before I started paying attention to what I eat). The bread certainly wouldn’t have been natural. Maybe it would even have been (gasp!) white bread! The eggs would be standard white eggs from caged hens. You know, the insanely cheap eggs (both price and quality-wise). Maybe the jam would have been natural, but only by chance. The coffee almost certainly would have used some sort of artificially flavored Coffeemate. Ugh. Just thinking about how much better I eat now … completely amazed.